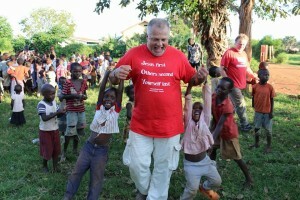 Fred playing with some of the children. God has given all believers a mandate to defend orphans, to seek justice for the orphans, and to deliver them from their wicked oppressors. The Calvary Orphan Outreach Ministry has been established to help fulfill this mandate from God and to seek out orphans in their distress. The ministry strives to develop an awareness of the plight of the abandoned and vulnerable children overseas as well as domestically, and then encourage believers to minster to these children. 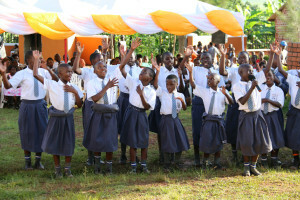 Planting the seeds of HOPE in Orphan’s hearts, one child at a time. Our goal is to ensure that as many orphans as possible find a permanent home within God’s kingdom and begin their new life as a child of God. These kids love to sing! The Calvary Orphan Outreach Ministry uses a two pronged approach to accomplishing this goal. The first approach was to establish a partnership between our ministry and the Faith Community Church and Orphan Home in Jinja, Uganda. This partnership has created an incredibly effective solution that allows our ministry to work alongside the indigenous church by providing monthly financial support, prayer support, gifts in kind as needed, as well as sending ministry outreach teams to Uganda to engage in the day-to-day work of ministering to the local orphans in their community. The members of the our ministry believe that it is the will of God for His church to respond to the needs of the abandoned and vulnerable children of this world. 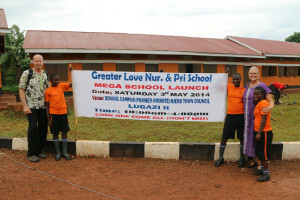 The grand opening of the Greater Love school. The second approach is to encourage and educate our church family about the joys of either fostering or adopting a waiting child through the United States foster care system. There are approximately 150,000 adoptable children in the US waiting for loving families to permanently open up their hearts and homes for them. Even if God is not calling you to adopt or foster one of these vulnerable children, there are still many ways in which our ministry can help. We can raise up and support foster parents, recruit and support adoptive parents, minister to state child-welfare workers, provide emergency respite care for foster families in our county, become mentors to some of the children and foster parents. It’s all about coming along side of someone who either works with these children or the children themselves, to provide loving care and support on a regular basis. For more detail information and how you can get involved, please be sure to check out our Calvary Orphan Outreach website by clicking here.